Either you run with the pack or you lead the pack. 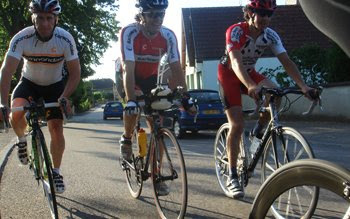 Yesterday Anja was pushing hard to lead the pack on a 50k ride into France through the cities of Sierenz, Altkirch and Ferrette. We recently discovered that riding 50-60 kilometer rides is much more suited for Anja because it allows her to push herself harder throughout the ride and challenge herself more which results in more fun, better exercise and improved performance. This is not really a surprise since it is often more fun to go fast and hard than having to struggle the last 20 home. The landscape and scenery of yesterdays ride had a remarkable resemblance to Danish country-side: Small rolling hills, narrow country roads and the smell of corn fields. Simply perfect for a Wednesday evening ride.